Why was this route chosen? In the 2014 Provincial election, the Liberal’s promised High Speed Rail. David Collenette was then commissioned to write a report to justify the building of High Speed Rail. Collenette rejected 300 kph HSR as not being economically feasible and recommended that 250 kph HSR be built. The problem is that HSR requires a straight route as the curve radius for 250 kph trains is 2.5 km and the trains can’t easily go around obstacles. By the way, the curve radius for 300 kph trains is 6 km so marginally higher speeds cause a substantial increase in difficulty. Somebody (MTO?) rejected the 250 kph trains between Kitchener and Toronto and limited the speeds to a maximum of 200 kph for that segment, although the average speed is likely to be 75 kph or less. David Collenette said in the CBC interview on Feb 13, 2018 (see sidebar), that the only place that HSR could be built is between Kitchener and London. So that is where it is being built. Huge disruption to the fertile agricultural community between Kitchener and London. St. Mary’s, Stratford, Ingersoll and Woodstock are bypassed by high speed rail. 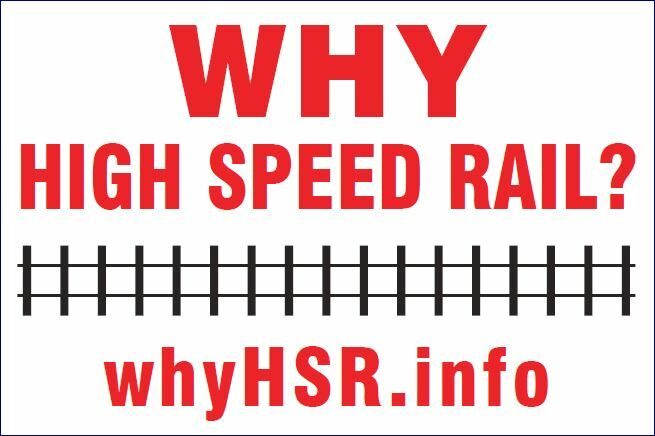 HSR will not help solve peak congestion problems in the GTA. ← Why not just build more highways? Unlike passenger rail they don’t need subsidies.